Olive Dragonfly: Yo! Bridezilla addict! I have been super busy the last couple of weeks or so, hence lack of posts - and I have so much to write about!! As you could not have missed, there was the Royal Wedding and I was very excited to watch it and see the fashion, ideas and if/how Kate managed to get her own ideas into the day. (Totally LOVED the trees in the Abbey! Brilliant idea!!) I wasn't disappointed and thoroughly enjoyed watching the whole thing, even more than I thought I would. Now, to explain the Yo! part of my title, about 3 days before the wedding, I received an email from Yo! Sushi informing me about their special, limited edition Royal Wedding Hand Roll and Plate. They were raising funds for Help For Heroes for William and Kate's wedding charity gift list and selling new smoked salmon, cream cheese and cucumber hand rolls on these specially designed plates for a mere £2.50. AND, if you buy the plate on the actual wedding day you get to keep it!!! Cue, VERY excited Bex!! Totally perfect souvenir of the excitement of the RW for me given that we're getting married the same year and I HATE all the tacky china plates for sale in the shops! I was already trying to think of a way to use it in our wedding day - maybe for our pudding! Just the fact they were giving away a Yo! plate was exciting enough for me! I properly love Yo! Sushi, we even have the recipe book and all the kit to make it at home!! So, having chanced my arm in case they let us keep them when we went to Silverburn enjoy the last :( Blue Thursday in April and being told we couldn't keep them until the actual wedding day, I raced into my closest branch in House of Fraser in Glasgow after the wedding to get one, only to be told they had sold out already as they had given them away the day before! Unfortunately by the time I got to the Silverburn restaurant, they had literally just sold the last one! 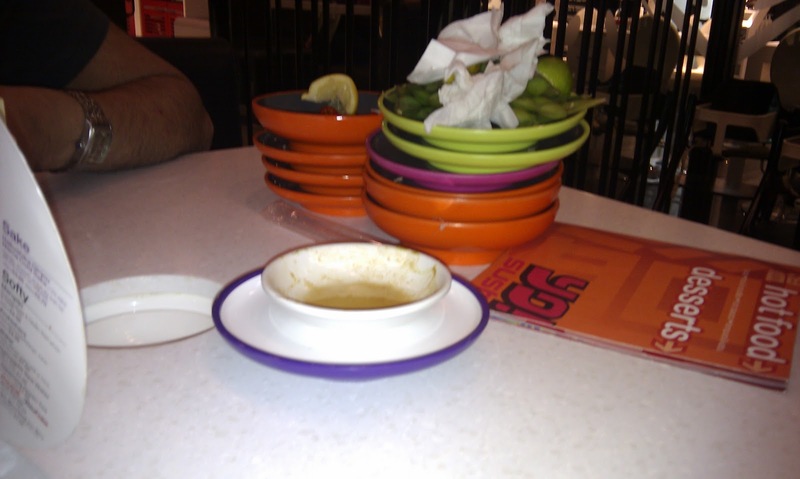 Despite me hanging around in case the person who ordered it didn't keep the plate - he did - I was unable to get one. I even considered driving to Edinburgh but decided this was just a bit too crazy even for me! So, anyway, to get to my point - do you have any spare Royal Wedding Plates lying around or lost in the bottom of a box somewhere in an office and if so, would there be any chance you could please send one to me? It would make me the happiest bride so I can surprise my hubby-to-be with it and I would gladly make another donation to Help For Heroes! Glasgow Bridezilla and Yo! Addict! Thanks for getting in touch and am so pleased you love YO! Sushi and our RW plate! Unfortunately we only produced a small quantity and they really are completely gone, I even need more for our own purposes but alas we don’t have any more. Really sorry about this, we are still hunting around and obviously if there is a spare one going that miraculously appears, I will be sure to send it to you. In the meantime, although I know it’s not the same, I’d be happy to send you one of our normal restaurant plates. Let me know if that will go to some way in helping you out. 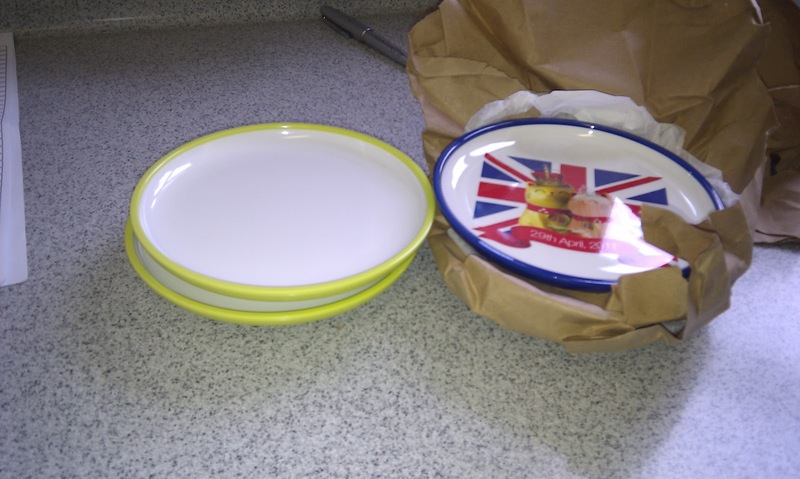 News alert – we have just found two spare RW plates for you! My colleague will get in touch with you to get your address and post one out to you. Perhaps you could send me a photo of you and your hubby eating sushi off our RW plate? Then I just got home from work and found this! I can't thank you enough and will certainly make another donation to the charity by way of thanks! No problems at all Bex! Hope the wedding goes well and you enjoy eating your sushi breakfast off our Royal Wedding plates – we will put them in the post today for you. I was expecting one Royal Wedding plate and very excited about it! The very next day a special delivery package arrived for me - I was totally clueless as to what it could be as I wasn't expecting the plate to arrive so quickly, plus it was a rather large jiffy bag! Inside I found TWO packages wrapped in brown paper - one labelled RW plates and one labelled lime green plates!!! Inside which I found TWO of each plate!!! Dear Bex, Enjoy your Royal Wedding breakfast brunch Yo! Sushi style! All the best for the big day. We weren't even finished yet!